Family of ours, down country from us, lost their foreign exchange student in a needless accident, early afternoon on Wednesday, a week ago. He and another student fell from Paritutu Rock and haven't been seen since. Neither has the instructor who dived in to save them. Police are now treating the operation as a body recovery mission. The families and the entire town are reeling in shock, over the loss of these dear ones. And a community in Brazil - the home country of one of the missing, has been rocked by the news. And I was angry. Yes, very angry at first. 'Why?' I had asked, along with countless others.. 'Why did this happen?' 'How could parents, teachers, professionals let.this.happen?' It seems so senseless ... tragic... needless. And we are removed from the worst of the pain, not having met these people in person. We've just spent the week going about our lives, while indirectly experiencing the grief we know our family and so many in the town, are feeling. I realise I feel somewhat guilty in a sense. While their worlds have crumbled to an abrupt halt, the rest of the country – nay...the rest of the world - carries on. Marching forward. They are going through something most of us parents can not comprehend going through - is that what we should pray....That eventually they will make it out the other side, whole again? Or do we pray for their men to return? And if they don't? Does that mean out prayers have been unheard? Do I pray for the grief to be short lived? Or for the process of healing to somehow result in unexpected good and restoration? Maybe I should pray for the other children who witnessed the ordeal? Or for protection for my children, for the missing ones' siblings, for my sister-in-law’s children, for my best friend's children...that they may never encounter the same fate? It will never make sense why these men have been lost so young. The question can either taunt us or it can bring us closer to God. We must trust His will for their lives and our lives. We have to trust that God’s plan for their lives was enough. Remember the wonderful memoirs and the impressions these beautiful people have had in the numerous lives of those around them. Remember the truths they shared. The noble things they have done. The way they stood up for what was right. The pureness of their hearts. The loveliness about them. The admirable qualities in their lives. Pray and think on the excellent and praiseworthy things that made them who they were. We think a long, vigorous life is the ideal life - but well-being and longevity are not necessary...for a life of love. Is a life more because it’s long, less because it’s short? For reasons only God can measure, this was their time to depart the unjust world we live in and go on ahead to the days of no more suffering. We need to trust in the Lord and let our love of the Lord be demonstrated. 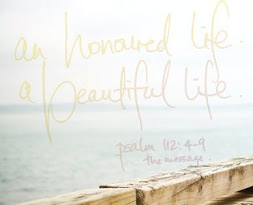 We need to live our lives in every way to glorify our God. So I will pray that Our Lord's Will be done. And I will give thanks for the beautiful things these people have shared into the lives of others. For after all is said and done, HE is in control and he doesn't need us telling him how to take care of things.